Between November 1962, when he became president, and November 1966, when his party was routed in the midterm elections, Lyndon Johnson spearheaded the most transformative agenda in American politics since the New Deal. In just three years, he drove the passage of the Civil Rights and Voting Rights Acts, the War on Poverty, and Medicare and Medicaid, among a raft of other progressive initiatives. Dubbed the Great Society, it was an agenda whose ambition and achievement have never been matched, and it remains largely intact fifty years on. 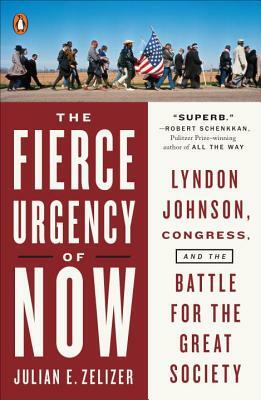 In The Fierce Urgency of Now, Julian E. Zelizer takes the full measure of the story in all its epic sweep. He provides unprecedented insight into the battles that raged inside Congress and the administration, and examines the often bitterly divided forces at play in the country—from religious groups and civil rights activists to labor unions and the media—during the tumultuous years when our political sights were set on the ideal of a Great Society. Julian E. Zelizer is the Malcolm Stevenson Forbes, Class of 1941, Professor of History and Public Affairs at Princeton University and a fellow at New America. He is the author of numerous books on U.S. political history, including Jimmy Carter, Arsenal of Democracy, and Governing America.